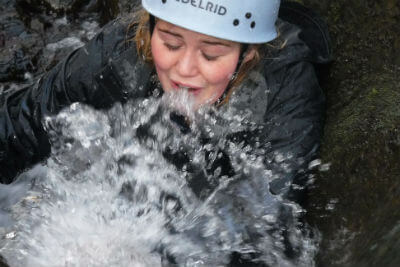 Gorge Scrambling Experience book online! 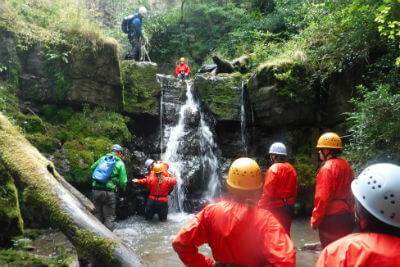 Gorge Scrambling is very popular activity and suitable for all ages. There's lots of fun to be had, climbing waterfalls and scrambling over rocks, as well as a few challenges along the way (depending on how brave you are!) - from balancing along ledges above the water to venturing through a tunnel with water rushing through. Conquer those fears and you'll feel a fantastic sense of achievement! Our gorge scrambling experience takes place near Abergavenny on the edge of the Brecon Beacons National Park in South Wales, a stone's throw from the Forest of Dean & Monmouth. For group bookings, or if your chosen date isn't available, please call 01600 891515 or email to find out more.